During 1957 the band appointed Mr Ken Grainger as Bandmaster who managed to keep the moral and performance of the band to a high standard. Sadly Mr Jock McManus passed away that year and Mr Halstaff had retired due to ill health. lt was during 1957 that a Mr Ned Jordain retired, he was an honorary member that had trained many younger members to play. Mr Jordain’s son Eric then carried on the good work. lt was in 1959 that another bandmaster was appointed, this was a Mr White from Torquay. Mr Grainger had resigned because his work as a commercial traveller took him away from the area. 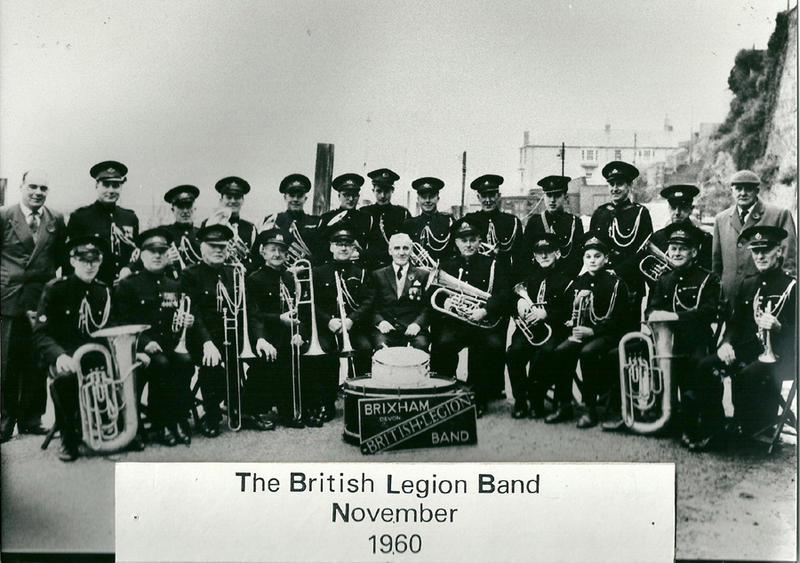 During the year 1960 Mr Douglas Hutchings joined us and he was made deputy bandmaster, he had moved to Brixham from Beaminster in Dorset were he had conducted the village band after retiring from the Royal Marines. Mr Hutchings gave a great boost to the Brixham band and was a loyal member for many years. Up until this time all the bands equipment and chairs had been carried to the fish Market and back to the lce Factory in Eric Jordain’s Furniture van, but this year we had an offer from the landlord of the Rising Sun Pub opposite the Fish Market to keep our chairs and equipment at the back of the Pub. The landlords name was Mr Edward’s and of course many of the band used to nip for a quick one at half time. The only trouble was that there were always two members of the band that seemed to hang on for an extra drink. Now these men were Scrumpy drinkers and this stuff seemed to be much stronger in those days. The band had to strike up before they came out of the Pub and the music never seemed to sound as sweet for the second half of the programme. These two members were Enoch Wills (Trombone) and Bill Pople (Bb Bass). l don’t think they ever washed their instruments out and rough cider does not agree with brass instruments. ln 1962 Duggie Hutchings was elected bandmaster and the bands performances improved to a much better standard. lt was realised the condition of most of the band instruments had deteriorated so it was decided that all members would make a donation towards repairs and to gradually replace the worse ones. The music was also in a bad state so all members donated five shillings from their honorarium to replace and buy new music. A set of marches for the band would have cost about E1.00 compared with over E10.00 in 1962.
instruments were also much cheaper in those days. One member bought his own second hand cornet in 1956 for twenty five pounds. Nowadays a » similar instrument would cost around E250.00 or even more for a brand new one. ln 1964 an offer came from the Harbour Master Capt. Goule (who incidentally was a member of the band) to keep our chairs and equipment in a fisherman’s store on the quay, which we gladly accepted. lt was very convenient having such important people in the band. 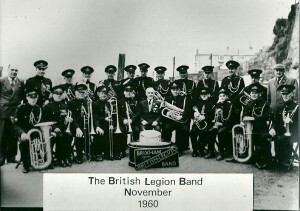 During the summer months the band used to play for Community singing on the quay. The idea came from concerts which took place annually, when the singing was conducted by Sir Arthur Cager and Howell James of Wembley Cup final fame, the concerts were sponsored by the Daily Express who also provided the song sheets.